To me, summer means long days, warm nights, beach time and barbecues. There’s nothing better than charbroiled hamburgers, a glass of ice cold sweet tea and spending time with friends on a relaxing summer afternoon. But a big barbecue can also become a financial burden, especially if you have a large guest list, need to rent a pavilion, and you have a mile long shopping list with expensive meats, beverages, and elaborate desserts. The planning that goes into these events takes a lot of work, and keeping within a budget doesn’t seem as doable once you’re so deep in deciding what kind of hot dogs or paper plates to buy. 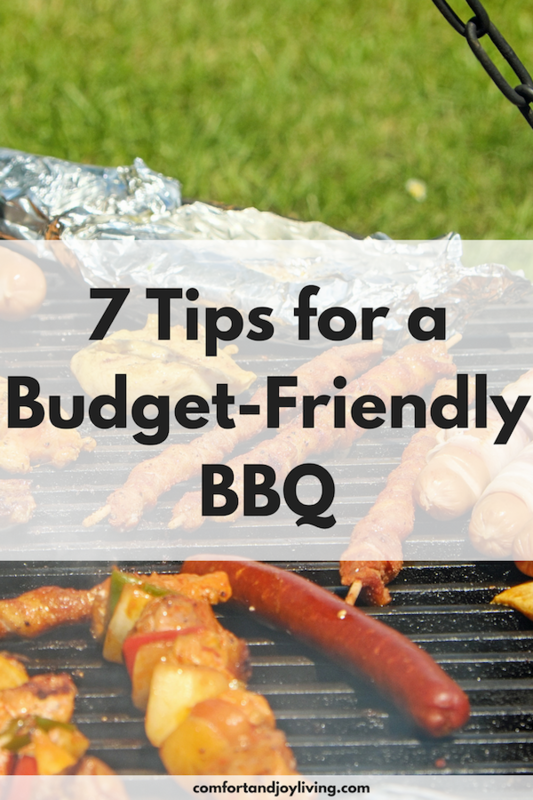 Thankfully, here are 7 ways that you can significantly save on your next backyard barbecue, and all of them will help you stay within budget. Each budget-friendly barbecue tip can be used whether you’re planning a huge party or a simple get-together with friends! I used to pride myself on being a good hostess and providing absolutely everything. Then I realized that I was focusing more on the preparation and less on my guests. And since I was buying all the food, I wasn’t being kind to my budget either. Since then, I’ve learned that there’s no shame in allowing your guests to pitch in. Now I prepare a menu with guests in mind, and highlight or circle each of the items I want to delegate. When someone asks me what they can bring, I can just give them one of the options on my list. Usually, it’s hamburger buns and hot dog rolls, salad fixings, chips, fruit, or dessert. Even simple foods can be a huge help. With Pinterest, it’s very easy to gather party inspiration and DIY ideas that don’t break the bank. Start a summer BBQ board, and pin anything that strikes your fancy. There’s usually a simple tutorial involved that you can easily replicate. For invites, you can use simple card stock, stickers and stamps that can work wonders and the handmade touch makes it really personal. I can usually whip out 25 in an hour and they always receive wonderful compliments. If you find that you don’t have a particular supply item to make an invitation or a DIY project, think about what you can use around your home without buying anything new. Now is the time to get creatively crafty and make do with what you have. During the summer, grocery stores run a lot of sales that include everything from hamburgers and hot dogs, chips, soda and marshmallows. Combine these sales prices with coupons in the Sunday paper, and you’ll be able to score items for quite cheaper, and sometimes even free. I try to stock up on these rock bottom prices for the entire year, so I have enough to last me he entire summer. By Labor day, sales phase their way out for the Fall and Winter baking season, so grab what you can while the prices are right. What’s a barbecue without meat? Meat can take up your entire budget depending on the type of meats you buy, but there are some ways to cut down on the costs while still pleasing the meat lovers at your party. I have found that ground beef from Aldi and Save-A-Lot discount stores taste just as good for a fraction of the price, and if you’re in a time crunch, frozen patties from the grocery cooler work great in a pinch. For kabobs, place a few veggies in between the meat to stretch it even further. Your guess won’t even notice! Don’t send money on rubs and sauces when you probably have all the ingredients in your own kitchen. Rubs are a combination of different spices, so you can use essentially any spice that you have, and most barbecue sauces start with a ketchup or tomato paste base. Plus, it can be really fun to experiment with all sorts of flavors and blends. When it comes to supplies like paper plates, serveware and tablecloths, it’s best to go with cheap and generic options. Often the best place to shop is a dollar store like The Dollar Tree which carries items like spatulas, tongs and plastic serving dishes and bowl or exactly $1.00. And don’t forget to stock on paper plates, napkins and utensils, as well as seasonal decorations like balloons and banners. If you’re trying to host on a budget, it can be a challenge to offer a full bar with soda, beer and juice. As an alternative, offer up a “signature” beverage like lemonade that can be “spiked” or doctored as preferred and water. It’s perfectly acceptable to ask your guests to BYOB if they prefer beer, wine, or a special beverage.